The great features make it a good value even though it's not that fast. The $249 dual-bay, DS216play is the least-expensive NAS box available featuring hardware-assisted 4K h.264/h.265 transcoding that we know of. And unlike its arch-rival, the QNAP TS-251A, said transcoding delivered smooth video to all types of devices. It’s a neat future-proofing trick (few users work with 4K at the moment), and Synology’s DSM operating system and app library also let you employ the DS216play in a vast array of roles. The $249 the DS216Play sets you back is relatively inexpensive for a dual-bay Synology box. That low price tag doesn’t show via the STM STiH412 CPU with 4K transcoding support or the 1GB of system memory, but it does make itself known in the lack of amenities, such as front USB ports or a quick-copy button. Also, you must disassemble the case to install drives (it ships unsecured to save you a step), which reside in static bays, not trays. It’s workable, but much less convenient than sliding a tray in and out. The Synology DS216play's performance didn't impress. The port selection is adequate if not overwhelming: gigabit ethernet, a USB 2.0 port, and a USB 3.0 port, all on the back. Alas, while it does a bang-up job transcoding 4K UHD (2160p) video, the DS216play is otherwise a somewhat weak performer by today’s standards; it's only a tad faster than Seagate’s Personal Cloud. 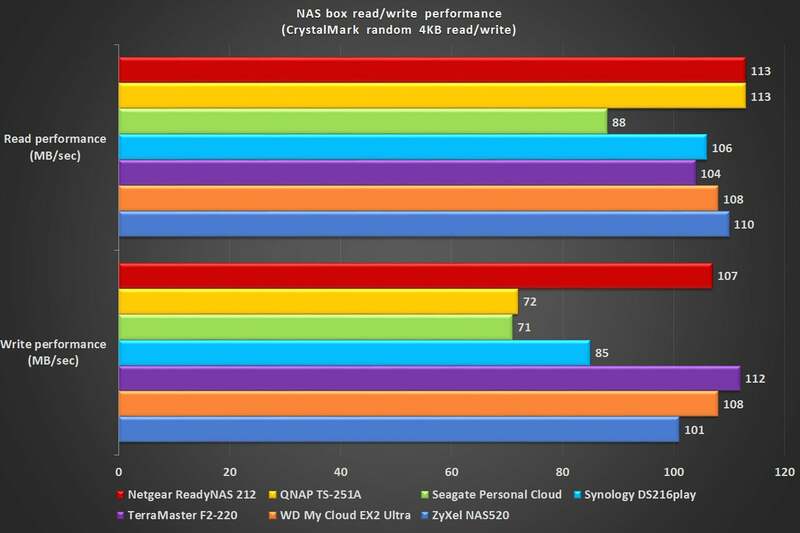 It beat out the arch-rival QNAP’s TS-251A by about 10MBps when writing, but it was a much slower reader. The performance is more than adequate for streaming to one (2160p) or a few devices (1080p), though backup times will be on the slow side. A huge upside to the DS216play--all Synology boxes, for that matter--is the nifty windowed operating-system-in-a-browser and a cornucopia of applications. Said apps allow you to do everything from serve websites (including content management) and email, to employing a USB camera for video surveillance. 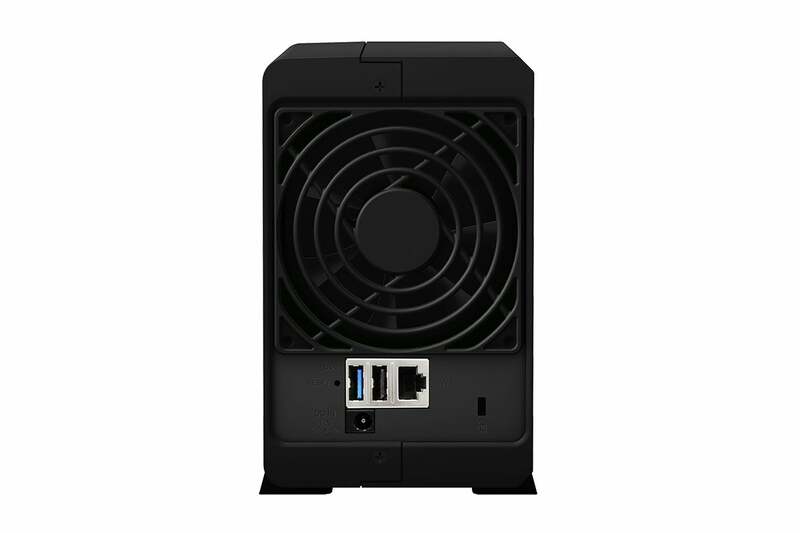 Pretty much everything useful that has been developed for the Linux operating system has been ported, which makes Synology boxes a great choice for small businesses and enthusiasts. 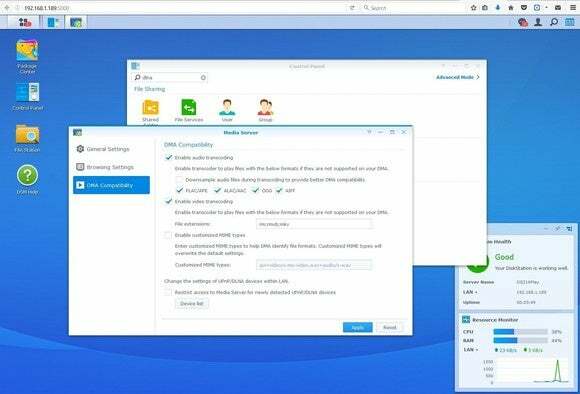 Synology’s windowed browser interface is filled to the brim with handy apps and utilities. Media apps abound, including iTunes and DLNA servers, the aforementioned on-the-fly video transcoding up to 4K UHD (2160p), as well as the ability to stream compressed audio files up-sampled to CD-quality 44.1kHz/16-bit via the awesome third-party music server from Roon. Roon is pricey, but it makes a noticeable difference in sound quality. Synology includes its own apps that let you play video, show images, and listen to music directly from a browser, with versions also available for Android and iOS devices. Plex is also available to cover anything Synology’s apps don’t. The DS216play is rather Spartan when it comes to ports. For backup, data synchronization, and interfacing with online storage services, Synology is second only to QNAP. Not only does the company have its own Cloud Sync app with clients for Windows, Mac, iOS, and Android, the DS216play can connect with Azure, DropBox, Google Drive, One Drive, and about a dozen other lesser-known storage repositories. Our only complaint, one that won’t affect the average home user, is that it won’t back up via FTP, as most NAS boxes will. That’s kind of an IT thing, but it’s still an odd omission. You can easily access the DS216play, as well as your files, remotely via Synology’s QuickConnect web portal. You may also, of course, use the traditional public IP/router configuration method. 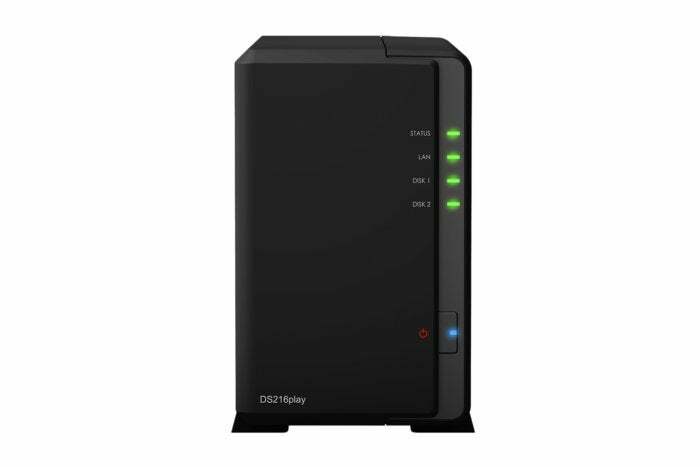 The DS216play is quite a bit slower than many like-priced, and even significantly less-expensive NAS boxes. But it’s fast enough for the average user, and it’s far more versatile, with media features for days, tons of small-business apps, and 4K UHD (2160p) transcoding that actually works. Sweet.